When Should You Get a Running Coach? | Fit Girl. Happy Girl. I would want to push myself and keep trying to train solo until I hit a major plateau. Like, running a non-PR when I felt I was well-prepared 3+ times. Until then, I would want to see what I can achieve on my own. 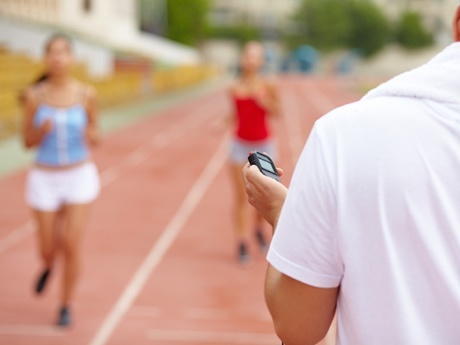 If every race has been a PR for you, sounds like you are the perfect coach already! I’ve been mulling it over lately, too. I used a training plan to get ready for my first half and I try to find information online, but I feel like having someone help me figure out what works for me and who I can have a conversation with seems like it would be more helpful. I know I need to do some speed work on the track…but I have no idea what to do! I just started working with a running coach at the beginning of this month after going it alone for the past year. I wanted someone who could help push me past my comfort zone and help me achieve a certain pace goal for my first half marathon. So far I have had nothing but a great experience! My coach immediately set a goal for me that I thought I had no way of achieving at this time, but she said “I really think you’re ready to do this” and then I did it on my very next run. That’s the beauty of having a coach, at least for me! I won a race entry into the Berlin Marathon and the coaching. I have to say that I am really glad I have a coach to help me get to the starting line of my first marathon. It’s mostly online coaching, but I have met her in person (which I think is important) and she will also be in Berlin to support our group of newby marathoners in Berlin. Sounds like you should. I would if I was racing more. Go for it!